I'm continuing with updates and I've also started hosting pages on Tapastic. I think it's better for readers. It's organized into episodes so you don't get lost in the Flickrstream. But if you prefer Flickr, I'm still updating there, too. All right: this is the page I was hoping to get done this week. And now it's done. No more updates for several days. I was planning to get two pages done today but, you know: crosshatching. My latest graphical project! Updating regularly on Flickr. I'll try to manage a few pages a week. It will be about 5000 pages long, if I finish. So maybe 120 pages or so is a more reasonable target, before I turn to Descartes and Kierkegaard and give them the same treatment. We'll see. UPDATE: Welcome, visitors from Daily Nous, Facebook, elsewhere! I am delighted and gratified to be getting so much appreciation for an oddball project, right out of the gate. Please come back next Thursday (June 2) for the next update. 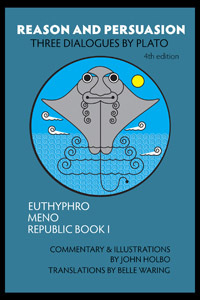 In the meantime, if you like cartoon philosophy, check out my Plato textbook, Reason and Persuasion. A more serious project, cartoons notwithstanding. (But you can't argue with the price! Free PDF's. Or get the paper version from Amazon; or whatever e-book option you desire.) 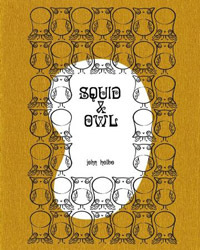 If you want to stick with silly poetry and cartoons, check out good old Squid and Owl. Available on Comixology. And it's all up on Flickr. I've already announced the book, but there's also the MOOC version of the course, through Coursera. Eight weeks of video lectures. Plato, cartoons. Some moral psychology. Fun and free online!